1.- Et factum est/Aleph-Quomodo sedet sola 7’57"
2.- Responso: In monte Olivetti 3'12"
3.- Aleph-Quomodo obtexit caligine 6'57"
4.- Posuerunt super caput eius 2'24"
11.- Invitatorio: Deus in auditorium 0'53"
12.- Salmo: Dixit Dominus – 4º tono 3'58"
13.- Salmo: Laudate pueri - 8° tono 3'18"
14.- Himno: Conditor alme siderum 3'34"
Las partes de canto llano proceden de fuentes toledanas del S. XVI. 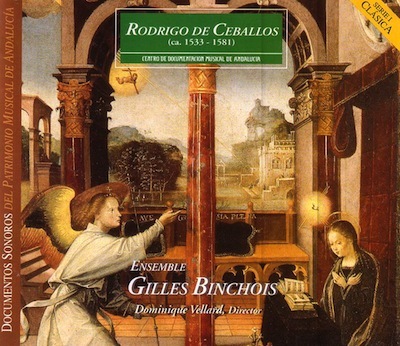 Rodrigo de Ceballos came from a musical family which had been very active in Burgos Cathedral throughout the 16th century. His father, Juan de Ceballos, entered the cathedral as a singer in 1532; and his elder brother, Francisco, was chapel master. Juan left Burgos around 1533, apparently bound for America. In 1536, he was in Venezuela, where he was a chapel master, though few further details of his career have come to light. The route to America passed through Andalusia. But little is known for certain about his journey through this region either (in 1524, a singer and organist called Juan de Ceballos was to be found in Granada Cathedral, though it is uncertain whether this was Rodrigo's father). We do know that Rodrigo was born in Aracena, in the province of Huelva, around 1533, though no exact date, nor even an exact year, is known, and neither do we know anything of his musical training. All that is known is that in 1553, the Chapter of Seville Cathedral hired him as a music copyist. In the contract, he is described as a "musician who is at present in the city and unoccupied". In 1554, he competed for the position of chapel master at Malaga Cathedral. The Chapter of Burgos wrote a letter of recommendation to the Bishop of Malaga on behalf of Ceballos, "son of Juan de Ceballos and nephew of Francisco de Ceballos, chapel master": He did not win the position, and remained in Seville as a singer in the Cathedral. In 1556, Cordoba Cathedral appointed him assistant chapel master, and in 1561 he competed for, and won, the position of chapel master in the Royal Chapel. The post included duties as Royal Chaplain, with all of the rights, honours and emoluments consistent with such high office. He remained there until his death in 1581, the exact date of which is unknown. He was one of the greatest polyphonists of Spain's Golden Age. Vicente Espinel wrote of him: "There was the great Ceballos, whose works brought such splendour to all of Spain". His complete works have been published in five volumes by the Andalusian Music Documentation Centre, edited by the recently deceased Dr. Robert Snow, Professor of Musicology at the University of Texas, in the USA. The laments are an appendix to the prophecy of Jeremiah, in which the prophet, with beautiful poetic expression, grieves over the capture of Jerusalem and the exile of the Jews by Nebuchadnezzar, King of Babylon. The Church uses them to lament the death of the Redeemer. In liturgy, they constitute the first three Lessons of matins on the sacrum triduum, Easter Thursday, Friday and Saturday. Since they were introduced into liturgy towards the end of the 16th century, these laments always had their own very simple melodic formulae, though somewhat more ornate than the other readings, particularly the letters of the Hebrew aleph-bet. In the original versions, they numbered the strophes and translated them from St. Jerome, and consequently, preserved their liturgical use. In Spain, ever since the Middle Ages, they had had more ornate, dramatic melodic formulae than those used in Roman liturgy. In the 16th century, several composers wrote polyphonic music for these laments, seeking greater solemnity in the Easter week matins, particularly on Easter Thursday and Good Friday, which were sung on the eve, that is, in the evening of Easter Wednesday and Thursday. Ceballos's two known laments are included on this record. They were published in Volume IV of his Complete Works. They are the first laments of Easter Thursday and Good Friday. Both use the Spanish melody as cantus firmus. It should be noted that Ceballos uses texts predating the liturgical reform that followed the Council of Trent. And so, the first contains a prologue or introduction, which was later eliminated: Etfactum est, postquam in captivitatem ductus est Israel, et Ierusalem destructor est, sedit Ieremias flens, et planxit lamentationem hanc in Ierusalem, et dixit: Aleph. Quomodo sedet sola civitas plena populo... – “And it carne to pass that after Israel was taken into captivity and Jerusalem destroyed, Jeremiah sat weeping, and sang this lament for Jerusalem, saying: How is this city so empty, that was before so full of people..?" El cantus firmus is taken by the contralto. The second lament does not today form part of liturgy, though it was part of pre-Tridentine Spanish liturgy. It is the first of Good Friday and was, therefore, sung on the evening of Easter Thursday. The cantus firmus is taken by the soprano. In this recording, these two laments are accompanied by the Good Friday motet, taken from the Gospels, Posuerunt super caput eius causam ipsius scriptam: Jesus Nazarenus, Rex Iudaeorum - "They wrote on the Cross, aboye His head, the cause of His death: Jesus of Nazareth, King of the Jews". There was a second part taken from the epistle of St. Paul to the Philippians: In nomine Iesu omne genu flectatur... "to the name of Jesus, all knees shall bow".